Now the village has a major role in the Brontë Stones project, celebrating the literary sisters’ legacy with memorials in landscapes that inspired their work. Commissioned by Bradford Literature Festival, and unveiled this weekend, the stones are carved with original writing - and, as the T&A has reported, Kate Bush has written a piece for Emily’s stone. The singer says it is a “thank you” to Emily, whose only novel inspired Kate’s breakthrough hit, Wuthering Heights. This year is Emily’s bicentenary and the 40th anniversary of the single. Poet Laureate Carol Ann Duffy has written a verse for Charlotte’s stone, Scottish poet Jackie Kay for Anne’s, and Jeanette Winterson has written about the Brontë legacy for the fourth stone. The engravings are by Pip Hall, who has worked on various literary projects. Walks around each stone, and a linear walk from Thornton to Haworth, follow the footsteps of the extraordinary sisters, who wrote some of the greatest works of literature. Michael is thrilled that Kate Bush has written for Emily’s stone, and has invited her to visit it. “I was seven when Wuthering Heights came out. It fascinated me; I wanted to know who Cathy was and why she wanted to be let in at the window... I read it in my teens, it was the first novel that made me want to be a writer,” says Michael, whose latest book, Ill Will, re-imagines Heathcliff’s missing years in Wuthering Heights. Emily’s walk is the longest, at 15 miles. “It’s for serious walkers,” says Michael. “It takes in Oxenhope, up to Thornton Moor, Nab Hill, dropping down to Top Withens, Ponden Kirk, the inspiration for Penistone Crags in Wuthering Heights, and Alcomden Stones, cave-like structures where you could imagine Cathy and Heathcliff hiding. Hero and heroine: Prince Myshkin and Jane Eyre. It’s a story of superheroism in disguise from the early 19th century, in a mostly London-set literary milieu that’s captured with curious and probing compassion. We’ve seen this before on film, in Ken Russell’s hysterically over-the-top Gothic, in Julien Temple’s messy Pandaemonium and in Byron, the stately BBC two-parter from 2003 starring Jonny Lee Miller. An intern and Brontëite in PennState News. The Armidale Express, The Senior, and Foster's Daily Democrat talk about this year's Most Wuthering Heights Day Ever. RCF (France) recommends Wuthering Heights as a summer read. 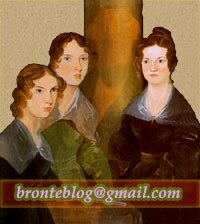 Happy Catholic reviews My Plain Jane and Rachael's Ramblings posts about the original Jane Eyre.